As Sandy Hill residents celebrate Heritage Month, it is worth remembering that not all of our neighbourhood’s colourful history occurred in the large mansions that still grace some of our streets. Two events that marked our history 87 and 89 years ago had nothing to do with prime ministers or other members of the elite living then in Sandy Hill: they were the Ottawa sewer explosions. The Ottawa Journal report on January 28, 1931 of the second explosion is so colourful that it is worth quoting at length. Sandy Hill and Upper Town seethe with excitement. Rocking large residential areas in Sandy Hill, Central Ward, New Edinburgh and Eastview, opening a crack 200 feet long in the roadway on Nelson Street between Somerset Street East and Templeton Avenue, and striking near-panic into hundreds of homes in which they wrought damage and distress, another series of sewer explosions similar to those experienced in the same districts on May 29, 1929, occurred in Ottawa with marked intensity shortly before 5 o’clock yesterday afternoon. Houses were shifted from their foundations, and walls and ceilings were cracked; windows in several homes were shattered, and furniture, crockery and other articles in many houses were damaged. 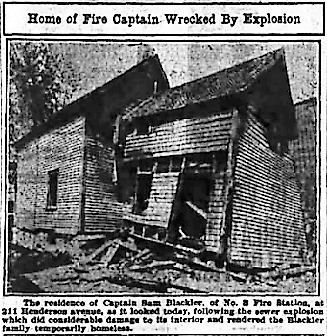 Residents of many homes in Sandy Hill were driven into the streets, with a low temperature prevailing, by gas which seeped into the dwellings immediately after the explosions. The force of the explosions was such that power wires as high as 40 feet above the roads had been severed as heavy iron manhole covers hurtled upwards, and in some cases even street lights were shattered. One of those who had a narrow escape was Munroe Dingwall, 12-year-old son of Mr. and Mrs. D.R. Dingwall, 133 Goulburn Avenue, who was proceeding along Somerset Street East near Goulburn Avenue with a party of friends on skis, when a manhole near him exploded into the air. The boy was literally lifted, skis and all, high into the air and deposited on a snowbank beside the street. He was momentarily stunned by his fall, but, when helped to his feet by his chums, was found to be unhurt, and was able to go home to tell the story of his narrow escape. Practically all the houses between Osgoode and Somerset, on Goulburn Avenue, and between Sweetland and Strathcona Park, on Somerset Street, had windows or doors open that evening in order to rid the houses and apartments of the strong odor of gas caused by the explosion. The damage caused by the 1931 explosion was extensive. A half-mile section of a 78” diameter brick sewer running along the Rideau River was shattered. To prevent backflow, sewage had to be poured directly into the Rideau River until repairs could be completed. While an investigation had been launched in 1929 and two more were in 1931, a cause for these explosions was never established conclusively. Many suspected carelessly dumped gasoline or a leak from a gas main but a suit against the Ottawa Gas Company for damages failed for lack of evidence. We may still occasionally grumble about city services but at least our sewers don’t blow up any more. Ottawa Journal, May, 1929—evidence of the impact of the first sewer explosion in Sandy Hill.